In response to Small Businesses are Not Hiring – Should They? I received a couple emails worth sharing. The CEO of a healthcare consulting company writes …. You ran a series of articles on small businesses, hiring and expansions. I thought I would add to it. I run a small firm, with about 45 employees and 40 contractors. We have been growing pretty well, close to 80% topline numbers for the past 3 years. Our average salary is over $100,000. We have some innovative software we sell to the industry. We also offer operational improvement strategies and IT consulting. We provide great healthcare insurance coverage to our employees. It is necessary in order to attract talent and I am in the talent business. Our healthcare costs went up 90% this year – and that is on a 6-figure number to begin with. We found only one insurer willing to provide us coverage, United Healthcare. Every other provider pulled out of our segment of the small business market. Cigna, our prior carrier, refused to renew at the last minute on a technicality despite being our carrier for the past 3 years. Our management team’s focus for two weeks was seriously diverted as we dealt with the consequences of this. Had we lost coverage altogether, we would have been out of business as our employees would go elsewhere. Our staff is young and healthy, by and large. Average age is early 30s, in the healthcare consulting, software and technology industry. Only in a severely government distorted marketplace can a firm with a young and healthy staff that has had coverage for years face insurers pulling out or demanding a 90% hike. We had plans to add one person to our R&D staff, a low 6-figure salary. That was shelved because of healthcare costs. Our software development cycle is slowed as a result. How has the healthcare bill helped the economy? In this case, not one bit. And everyone of my employees has been hurt, because we switched mid-year, those who were part way into their deductible have to start all over again. That is a few 1000s for a number of employees. Because of a bill that passed that cost us money, and most of our employees money. No one is happy with this. 1. Small business gets battered by the economy. The business is still profitable but less so than before. 2. The business sees its lending facility pared back or eliminated by their bank. 3. Small business cuts jobs, moves to a smaller building or stops future equipment orders so that their expenses reflect the reality of their new lower revenues. 4. These cuts also negatively impact other small businesses associated with the small business’ supply chain which gives the cycle a multiplier effect. 5. 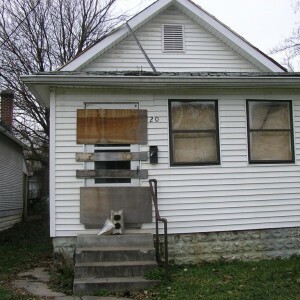 Small business owner takes their austerity program to their lender in hopes of restoring some of their lost borrowing capabilities. The lender looks at the lower revenues, layoffs and downsizing as a further deterioration of the business. The lender lowers the business’s line of credit even further. 6. The business now has to run on even less cash and is not able to replenish inventory at the levels needed to grow its business. 7. Go back to step 1 and repeat until the business becomes truly uncreditworthy and eventually becomes insolvent. I couldn’t agree more, and I see very little being done to help, either nominally or tactically. Neither the treasury market nor small business trends reflect the incessant optimism of the stock market. These will eventually align, when I do not know. Please consider NFIB Small Business Economic Trends for August 2010. 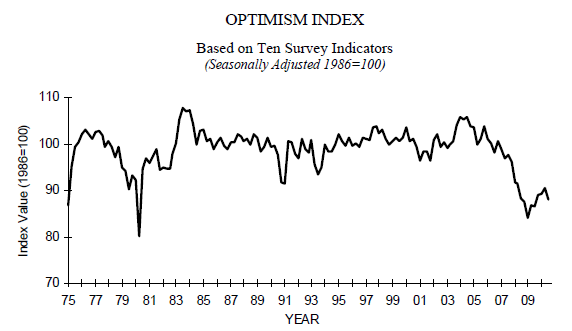 The Index of Small Business Optimism lost 0.9 points in July following a sharp decline in June. 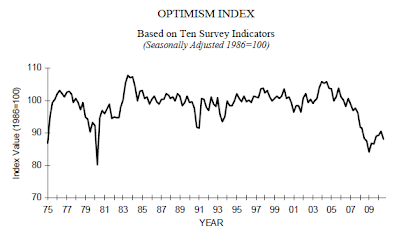 The persistence of Index readings below 90 is unprecedented in survey history. The performance of the economy is mediocre at best, given the extent of the decline over the past two years. Pent up demand should be immense but it is not triggering a rapid pickup in economic activity. Ninety (90) percent of the decline this month resulted from deterioration in the outlook for business conditions in the next six months. 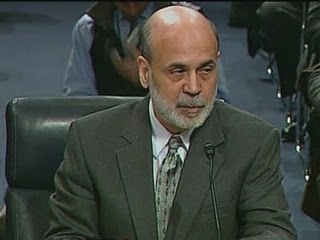 Owners have no confidence that economic policies will “fix” the economy. Ten (10) percent (seasonally adjusted) reported unfilled job openings, up one point from June but historically very weak. Over the next three months, nine percent plan to increase employment (down one point), and 10 percent plan to reduce their workforce (up two points), yielding a seasonally adjusted net two percent of owners planning to create new jobs, up one point from June and positive for the third time in 22 months. The frequency of reported capital outlays over the past six months fell one point to 45 percent of all firms, one point above the 35 year record low reached most recently in December 2009. The percent of owners planning to make capital expenditures over the next few months fell one point to 18 percent, two points above the 35 year record low. Five percent characterized the current period as a good time to expand facilities, down one point. But a net negative 15 percent expect business conditions to improve over the next six months, down nine points from June and 23 points from May. Like that picture of small-town America? 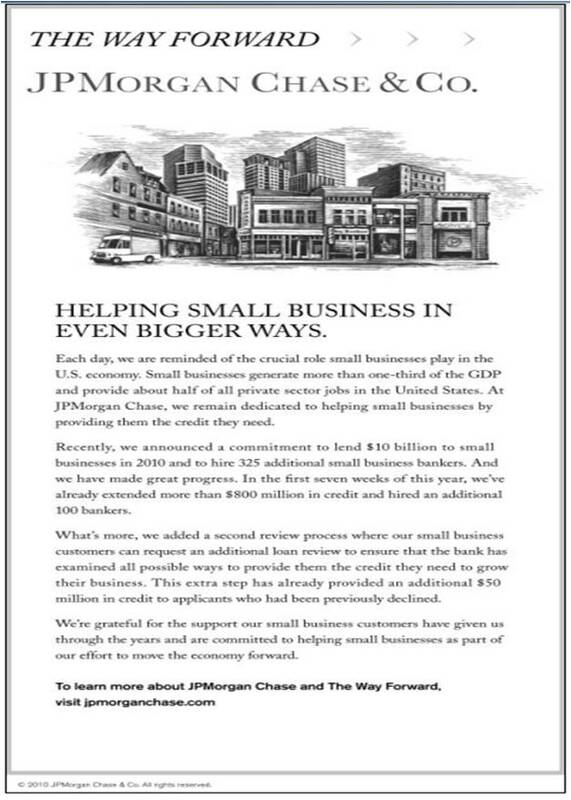 The main claim is in the second paragraph: a commitment to lend $10 billion to small businesses in 2010. These kinds of marketing claims are difficult to verify. But I gave it a shot. “Small business” lending, in JPMorgan’s financial supplements (great web page, by the way), is almost certainly “Business banking origination volume,” on page 13 (PDF page fourteen) of the most recent supplement. To see how JPMorgan Chase defines its business lines, see page 3 (PDF page eight) of this Realigned Financial Supplement. “Middle Market Banking” is included in Commercial Banking. So the “Business banking” segment of Retail Financial Services is almost certainly small business lending. In the forecast prepared for the December FOMC meeting, the staff raised its projection for average real GDP growth in the second half of 2009 somewhat, and it also modestly increased its forecast for economic growth in 2010 and 2011. Better-than-expected data on employment, consumer spending, home sales, and industrial production received during the intermeeting period pointed to a somewhat stronger increase in real GDP in the current quarter than had previously been projected. In addition, the positive signal from the incoming data, along with the sizable upward revisions to household income in earlier quarters and more supportive financial market conditions, led to small upward adjustments to projected growth in real GDP over the rest of the forecast period. 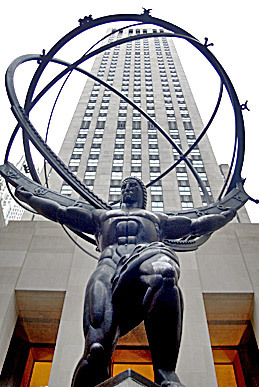 The staff again anticipated that the recovery would strengthen in 2010 and 2011, supported by further improvement in financial conditions and household balance sheets, continued recovery in the housing sector, growing household and business confidence, and accommodative monetary policy, even as the impetus to real activity from fiscal policy diminished. However, the projected pace of real output growth in 2010 and 2011 was expected to exceed that of potential output by only enough to produce a very gradual reduction in economic slack. Oil, nat gas and copper are up 20% since the staff determined consumer price inflation was "transitory."